One-quarter of Americans with two-car garages have too much stuff in the garage to park their cars inside. Not only can garage organization systems reduce the clutter once and for all, they are a smart home investment. Here are our top reasons why. When your garage is cluttered, you cannot find the things you need. In extreme cases, you might even waste money because you end up buying duplicates of items that you already own just because you do not know where the original items are. Since clutter on the garage floor can also be a trip hazard for children and adults, cutting back on clutter keeps everyone safe. Garage storage options provide a home for everything so you know where to look for items when you need them. From garage cabinets to shelving and overhead storage, there are many different ways to organize a cluttered garage. You can mix and match storage systems to find the right one for your needs. If you are one of the 25 percent who has to leave the car parked outside the two-car garage, then you know what a difference it would make to finally get that clutter off the floor. You would be able to park your car in the garage again, preventing weather-related wear and tear that prematurely ages your car. 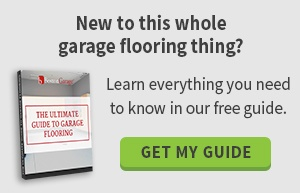 Even if things aren't that bad, you probably have items stored on the garage floor that could be handily organized elsewhere. With that extra space, you could add a hobby area to the garage, store seasonal items and reclaim a closet inside the home, or create a space for children's toys. 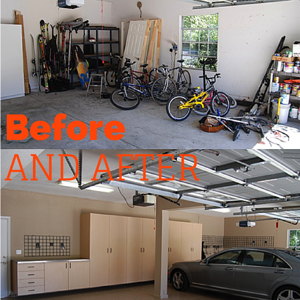 If you are thinking of selling your home, you must invest in garage storage systems. A well-organized garage is more attractive to potential buyers than a cluttered one, so you might get faster or higher-priced offers as a result of your garage storage. When the garage is clean, you can better showcase the space inside the garage. Better still, a minor investment in garage cabinets and overhead storage can increase your home's assessed value and generate a higher selling price for your home. If you plan to stay in the home, adding storage now will help you get the most use out of your house and increase the value when you are ready to sell! Get started on garage organization now by contacting a professional garage storage installer to discuss garage storage options for your home. Once you organize, you will wonder why it took you so long to call us for a free on-site design consultation!